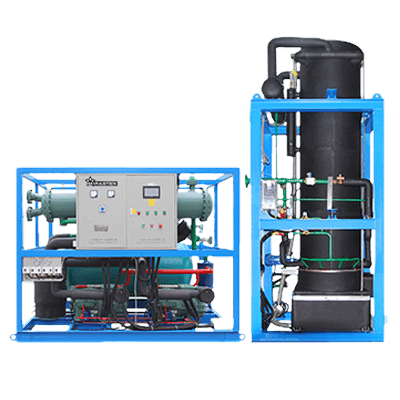 WIRASTAR TV series tube ice machine is a type ice machine, which produces cylinder shape ice with a hole in the middle; it adopts flooded evaporator model, which improves ice making efficiency and capacity. Meanwhile, compact structure design can save installation space. Ice thickness and hollow part size can be adjusted according to customer requirements. Under PLC program control system to work automatically, the machine has high capacity, low-power consumption and minimal maintenance.